Want straighter teeth without having to wear traditional metal braces? If you don’t want to contend with brackets and wires, Invisalign® offers an effective and comfortable solution. 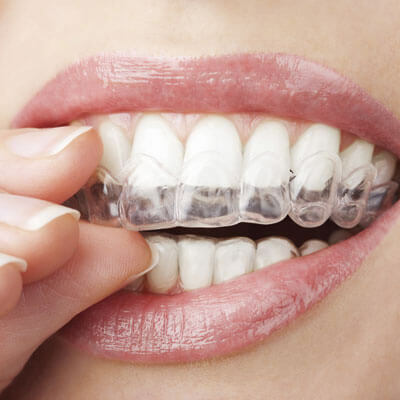 Invisalign® is a series of clear, comfortable plastic aligners that, through computerized manufacturing, gently move your teeth to the desired position. You simply change your aligners every 2-3 weeks until the treatment is complete. In addition to improving your smile, our invisible braces treatment can help improve periodontal or gum health. By improving your gum health, you can also bolster your overall health and possibly decrease your risk of conditions such as heart disease or diabetes. Before we get started, we will determine if you are a candidate for alternative braces. As part of our thorough assessment, we will examine you and have you come up with a wish list of what you’d like to improve. Next comes a planning phase. Dr. Lefebvre will take records (molds and radiographs), and then will work on the computer to design a case for you. We will also provide education about the very important retention phase when treatment is complete. If you’re ready to enjoy a healthier, more beautiful smile without having to wear traditional metal braces, give our office a call and ask about our Kingston Invisalign® services!